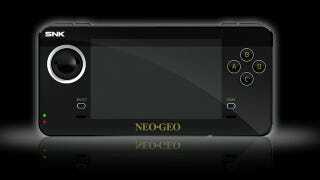 The new Neo Geo handheld gaming system, which we first told you about in January, will be going on sale worldwide in Q2 2012. Which is very, very soon! The system has been licensed by Blaze, kinda-famous for similar handhelds that play old Genesis and SNES games, etc, and will be called the NEOGEO X. As far as specs go, it'll boast an SD card slot, AV output, internal stereo speakers, headphone socket and a 3.5" LCD screen. World Heroes? Sign. Me. Up. No official word on price yet, but you can register your interest at the site below. And if you want to read more about SNK's last proper handheld system, the Neo Geo Pocket, check this out.